Although probably best known for extreme metal acts like Rotting Christ and Septic Flesh plus it’s fair share of epic/power metal outfits, Greece as a country also has bands that are willing to cross sub-genres in the hopes of establishing their own take on metal. That’s where Null’O’Zero comes into focus – together since 2012 and incorporating a mix of power, progressive, traditional, and thrash nuances from the past and present on their two full-length records. Their latest outing Instructions to Dominate contains diverse songs that can conjure up Brainstorm/Rage one minute, then Symphony X/Megadeth the next – along with a modern touch that may even bridge things for people into Avenged Sevenfold. Reaching out via Skype to drummer Lefteris Moros and guitarist Ilias Andritsos, you’ll learn more about the history of the group, specific lineup changes that caused delays in future output, their thoughts on opening for an iconic group like Accept in their home country, plus thoughts on how they handle the work/music balance. Dead Rhetoric: Null’O’Zero started in 2012 – what can you tell us about the formation of the group, and did you know straight away the type of contemporary aggressive music you wanted to play with technical and melodic riffs – or was it a question of feeling each other out and hone in on your songwriting craft? Lefteris Moros: Hello Matt, yes, Null’O’Zero started in 2012 and the first line up was myself Lefteris Moros on drums, Ilias Andritsos on guitars, George Del on bass and then Vaggelis Vilantzakis on vocals. When we started all of us had something in our minds but nothing more specific, the common idea was to play melodic and aggressive music. Especially Ilias who is the main composer of the band and his influences are bands like Megadeth, Death, Carcass and stuff like this. In the end when the band was formed, Ilias brought the ideas and then we put our influences in and then our music took another shape. All this work through the years made our sound more specific and kinda different. Also after the entrance of our latest members (Geo Sinner on vocals, Aggelis Kokkorogiannis on guitars) we reached the next level and finally we can say that now we are playing the music we would like to play since we started. I think that Null’O’Zero now is a 2018 heavy metal band with thrash metal elements, aggressive, melodic and technical as well. Dead Rhetoric: After winning a Greek metal battle of the bands competition, you got the chance to record material that would make for the Under Blood Red Sky EP later in 2012. How did you feel these first recording sessions went for the band, were there any surprises, challenges, or obstacles to push through – and what do you think about the final product now? Moros: As always, recording an album or an EP is an amazing process. It was a great start with this contest because the first prize was 70 hours of recording time in a studio. So that was the motivation for us to start immediately. You always will be a little bit anxious recording, especially if you are doing it for the first time. We had obstacles to push through but in the end our EP was the best that we could do at that time. Now I believe that this EP was the best start we could do as a newcomer, it was well played, well mixed with the potential for something bigger, that finally came with the new line up and The Enemy Within album. Dead Rhetoric: You mention in your background information months of inactivity during 2013 – was this due to personal problems of the lineup, military service obligations, or other circumstances? Did you ever worry that Null’O’Zero would cease to exist? Moros: In 2013 our former singer Vaggelis left the band. It’s kinda difficult to find a vocalist especially if you are a newcomer so it was a hard period for the band! We didn’t worry about the existence of the band because one way or another we would find a solution to remain active. So in 2013 we said okay, that’s enough now we will make a reconstruction of the band, we will find a new singer and one more guitarist. We were convinced that we would find those members soon, but on the other hand we were ready to remain silent until the relief was ready to join our purpose. We did a few auditions with great musicians and singers but we said ‘no we will not compromise, we’ll find the best’’. A few months later we came in touch with Geo Sinner and Aggelos Kokkorogiannis who joined the band. Then we started from the beginning with new lyrics, new vocal lines, one more guitar and more energy to do The Enemy Within album. The only songs that remain the same since the “Under Blood Red Sky” era are “From the Darkness” & “No More Wait” songs, you can find them both in the U.B.R.S. EP and on T.E.W. LP as well. Dead Rhetoric: Tell us about gaining the opportunity in 2015 to open for Accept – what did you think of the crowd, your reception as a band, and how was it to play with such a veteran, legendary band? Moros: To be the opening act for one of your favorite bands is a dream came true. Accept is one of our favorite bands- our other guitarist, this is his favorite band. It is amazing to share the stage with legendary bands like Accept and this is not the only performance of ours as a support act for a legendary band. In 2016 we were the opening act for Iced Earth and a few days ago we were a part of the Greek fest Rockwave Festival among Judas Priest, Accept, Sabaton, Saxon and in the second day of the fest Iron Maiden, Tremonti, Volbeat and many many more. We are really blessed to have experiences like these it is amazing to share the stage with those titans, to play for such a wonderful and passionate crowd. I hope that we will hit the stage with great bands again in the future. Who knows, it seems that we have good momentum, so we have great things to expect. It’s a different experience to play club gigs in front of 300-500 people, but on the other hand sometimes you will be on the stage with bigger bands and play in front of thousands of people. It’s crazy. This is a dream come true for us. Ilias Andritsos: It was an amazing experience to see how people would receive us, and see us in a big venue. We liked it – and hopefully we will get more moments to make this happen more often. Dead Rhetoric: You joined Rock of Angels Records roster who released your debut album The Enemy Within also in 2015. How did the deal develop with the label, and what are your thoughts on this album – do you believe it helped gain more traction for Null’O’Zero beyond Greece into other markets? Moros: Yes of course. Rock of Angels is a newcomer type of record company, but has the same vision that we have as a band for this music. They want to do the best they can to market their bands. The bands have a greater say, Rock of Angels is always there for us. They did great work with The Enemy Within, because the band and the label were newcomers. We couldn’t believe our music could reach other countries across Europe including the United States as well. It was difficult for us to think about it, and the label was there to make it happen. 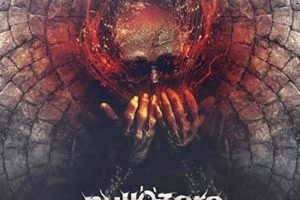 Dead Rhetoric: Your latest album Instructions to Dominate just came out – and it’s a fine mixture of power, progressive, traditional, and thrash sounds with also that aggressive, modern edge at times. Where do you see the growth of the group between records – did you have a better idea of what you wanted to achieve in terms of performances and songwriting this time? Andritsos: During the recording sessions and songwriting of this particular album, we had so many things that happened in our lives. We didn’t let these events interfere in the development of the songwriting – we had many good people that came to our team that helped us to achieve the goals of going a step further than the way we sounded on The Enemy Within. I think it was a very true step up within the band, we can do many things. Dead Rhetoric: What can you tell us regarding the album cover – and how important do you believe imagery and artwork becomes in conveying the proper message and outlook within heavy metal? Moros: The cover is very important for your style. When you are on the internet- the only thing that people can see is your cover. This is the first real outlook that fans are having with the band. I have to tell you a few things about the construction of the cover. This cover was done by Giannis Nakos, he has a company called Remedy Art Design. He’s done all of the three pieces on record that we’ve put out. He listens to our songs, he can feel things, and he knows what kind of (story) we want to tell. He makes the cover, and every time he makes the best artwork we can imagine. Andritsos: He reads the lyrics and he can understand what we are wanting to tell. The cover of the album is the same message we wanted to deliver to set the tone of the record. It’s the most representative cover that we could ever have. Dead Rhetoric: How would you describe Null’O’Zero live in comparison to your studio work? What do you hope the audience is able to get out of a show, and what have been some of the more memorable performances with the group to date? Moros: I think we are much better on the stage than in the studio. The power that is on a stage, it’s hard to capture on an album. Andritsos: Especially with the first album, it wasn’t as strong as how we can play the songs live. People that come to our concerts, they can see these songs are going over better live. The second album is stronger and closer to what we are like live. Moros: We are a band that feels the energy on stage. Every time you get on stage, you have this great power, you always want to give this adrenaline back to the audience. We love playing live, we can play our music better than on the CD. We have a great chemistry as a band, I think that everyone who sees us live can feel this. Andritsos: The most intense show that we’ve ever done has been the last one that we did for the Rockwave Festival a few days ago. Moros: It was very powerful. Dead Rhetoric: What do you consider some of the biggest challenges in gaining traction for Null’O’Zero to establish more of a following? Do you believe you’ve assembled the right team around you to help the band achieve their goals in a timely manner? Moros: We have a great team right now. We have people who know what they are doing in established bands in Greece. We are working with Thimios Krikos of InnerWish, and Fotis Benardo, the ex-drummer of the amazing Septic Flesh, when it comes to the producing, recording, and engineering. These people know what we have to do. We have a few challenges to come through- but we are always ready. Andritsos: The main reason why this second album is way better than the first one is because of these people that helped with their experience and knowledge to make things in a better way. It’s a good result and we will be able to expand things more. Moros: When you are a newcomer it’s always difficult to establish yourselves. People want to have something better from you- we are doing the best that we can, write great songs, to have great gigs. We believe that this work will affect the people that are following us – and more of them will follow what we are doing. Dead Rhetoric: How important are social media platforms like Facebook, Instagram, YouTube, etc. to Null’O’Zero? Do you enjoy the active engagement that you have with your fans, and consistently posting interesting/fun content across these platforms? Moros: All of these social media platforms are important for a newcomer band. All of the people are spending their time on social media- everyone who wants to listen to a song or contact a band. When I want to listen to a band, I type a band name into YouTube and listen to a few songs. Things like this also happen with Spotify- so you have to be there on those platforms because the first thing they are going to do to find music is use those platforms. It may be more important for newer bands than some of the bigger bands. A successful band like Judas Priest or Iron Maiden, I don’t think people are waiting to find out about them through social media. Andritsos: I think it’s a great tool for all bands to use, as long as you can make use of it properly. It adds to your profile, and you can see things and results that would take a longer time to accomplish. Dead Rhetoric: I would imagine the band members need to hold down day jobs to fund their musical activities. How do you individually balance out the needs of the band with also the work/personal life/family situations that also come up? Do you have the support from your families in these endeavors? Moros: We have support from our families, but it is a little difficult in Greece. Right now, the situation is not so good. It’s difficult to do everything, you have to work hard to live. At the end, the only thing that matters is the songs. Andritsos: We give our souls to this band. It’s our way to revive ourselves, it’s very hard to live here. For all of the band members. Moros: We are happy to do whatever it takes for the band. We are in love with this- we cannot imagine ourselves not playing music and just going to the office, having kids and families. All of us have families- but at the end of the day, we have to do something for ourselves. We are buying guitars, drums, etc. – because we are falling in love with this every day. Dead Rhetoric: What worries or fears you have most about the world that we live in today? If given the chance, where would you place the most time, focus, money, or energy on to make things a better world to live in? Andritsos: If we were able to do something in this world, be more humane. All the corporations and companies do not think this way. Moros: When you do not feel that you are free to say what you want, you can do this through the power of music. Andritsos: When the political system starts to collapse, it seems that the metal music scene starts to grow. Dead Rhetoric: What’s on the horizon for Null’O’Zero over the next twelve months? Moros: The first thing we are about to do is an album release party in Athens, Greece. We would like to visit other cities in Greece for the first or second time. I think that we would like to do a European tour. I can’t say anything about America, it would be a big dream for us to play there. We have influences from that scene for sure, especially the Bay Area thrash scene. Andritsos: We have some ideas left from the second album that we are working on, but it’s too soon to tell what will happen next. Maybe by the early part of next year, the third album will be in development.